Zachary Mayfield resides in the city of Slidell in southeast Louisiana. He is proudly active in his church, the National Honor Society, and National Beta Club, where he serves as president of each, and of course the FFA. Above all, Zachary's favorite pastimes include playing golf and traveling abroad. Zachary has been an FFA member at Pearl River High School for four years where he has served as chapter president for three years in a row. He was also a very involved member at Creekside Junior High School where he served as chapter president and won many competitions. Zachary also has served the Area IV Federation as junior vice president and vice president. He has competed in various Career and Leadership Development Events such as Prepared Public Speaking, Creed Speaking, Gulf of Mexico Speaking, Extemporaneous Speaking, Parliamentary Procedure, Meats Evaluation and Technology, Floriculture, and Nursery/Landscape. His proudest accomplishment through the FFA is winning the state Creed Speaking LDE his freshman year as it enabled him to see the depth of our organization on the national level. 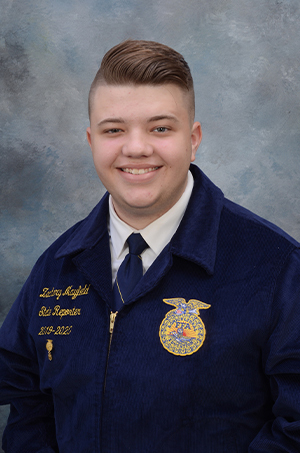 Zachary hopes to attend Louisiana State University where he will major in agricultural education, and he hopes to become a second generation agriscience teacher. Service is Zachary's main objective through the FFA, and he cannot wait to see what the year and members have in store! Zachary Mayfield is proud to serve as our 2018-2019 State FFA Sentinel.